Production of U.S. coins for circulation slowed in April and from a year ago, according to United States Mint figures released on Tuesday, May 10. The data also shows mintages of the 2016 Ronald Reagan dollar, the last release in the U.S. Mint’s series of Presidential $1 Coins which honors former and deceased U.S. Presidents. Coining presses in April struck nearly 1.34 billion in cents, nickels, dimes, quarters, and dollars. The total marks decreases of 7.4% from March and 21.1% from the same month a year earlier. The following table offers circulating coin totals by month and their rankings over the past year. The cost to make and distribute each Lincoln cent is 1.43 cents (in FY2015), making them money losers for the government, but the Federal Reserve always orders more of them than any other denomination. In April, the U.S. Mint produced 754 million cents, which is 56.3% of the circulating-quality coins made for the month. 63.1% more America the Beautiful Quarters. Presidential $1 Coins, Native American $1 Coins and Kennedy half-dollars are no longer ordered by Federal Reserve Banks but the Mint continues to make them in circulating quality for coin collectors. In January, the U.S. Mint struck Native American $1 Coins to the expected amounts needed for the entire year. That is usually how it works for Kennedy half-dollars but in February another 400,000 were pressed at the Philadelphia Mint and then in March another 400,000 were made at the Denver Mint. The agency in April continued to strike Presidential $1 Coins to support the final 2016 design featuring Ronald Reagan. U.S. Mint facilities in Denver and Philadelphia manufacture all of America’s coins for commerce. Last month, the Denver Mint struck 752.02 million coins and the Philadelphia Mint produced 587.04 million coins. Through the first four months of 2016, the Denver Mint made 2,558,200,000 coins and the Philadelphia Mint made 2,673,100,000 coins. That lifts the year to date total for both plants to 5,231,300,000 coins, representing a 11.6% decline from the 5,917,140,000 coins minted during the same period in 2015. This year’s monthly average of 1.3 billion coins tracks over 12 months to nearly 15.7 billion coins. Last year, the U.S. Mint delivered more than 17 billion coins for circulation, representing a sixth straight year of growth and the quickest annual production pace since the 2001. Mintages of Ronald Reagan Presidential $1 Coins are 4.48 million from Denver and 6.02 million from Philadelphia for a combined 10.5 million. The overall total matches the immediate prior release featuring Gerald R. Ford; is 700,000 higher than the first 2016-dated dollar commemorating Richard M. Nixon; and lies in the middle of last year’s issues which registered mintages ranging from 8.4 million for Truman dollars to 12.04 million in LBJ dollars. 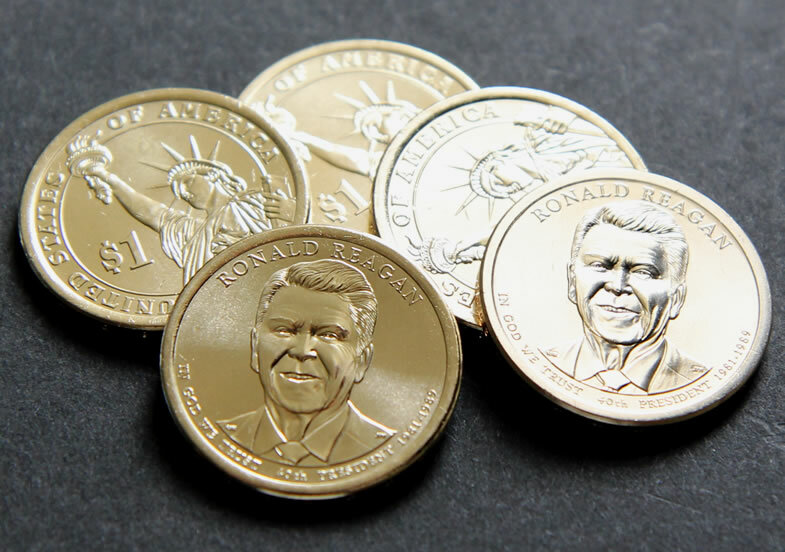 2016 Reagan dollars will make their debut in July. In subtracting the totals by coin design from the overall production figures by denomination, there is one difference — mintages of America the Beautiful Quarters are higher by 335 million. These are most of the Cumberland Gap National Historical Park Quarters for Kentucky. Cumberland Gap quarters started to enter circulation in early April. I see the mint has on its calendar a “date to be determined” Native American dollar Coin & Currency set (Item Number: 16RA)–the initial release date was in March. It probably will be an enhanced uncirculated coin like last year’s popular offering, now sold out. Wonder if it was also minted in January but not yet packaged. It is going to be a “S” Mint mark coin this year for that annual set according to the Mint’s website. Can’t wait to add them to the 2014 “D” & 2015 “W” sets. Wonder if the $1 FRN in the set will have a fancy serial number this year? Does anyone know this? The Mint says they lose .43 producing penny’s, but how much do they profit / lose on all of the other coins they produce? My suspicions tell me in the end the Mint is ahead in the coin game. Mike Unser on this blog reported the seigniorage profits on the Mint’s circulating coinage from the most recent annual report for fiscal year 2015 a couple of months ago. They lose a lot on the cent & nickel for many years now , but make many $ millions on the dimes & quarters issued for circulation. I had the figure from the report but lost it. Can you help us with this question from the last US Mint annual report seigniorage figures please? Ha Ha Ha . Vachon! Your cracking me up, and I’m a Reagan Conservative thru and thru. Of course us folks have the ability to laugh at ourselves. There you go Seth…. Trickle down economics in ACTION! You wouldn’t expect the attendant to accept Carter Dollars now would you? LOL! On a serious note, I am a “Reagan Democrat” & I actually miss that kind, wise gentleman in these crazy times. Oh yeah, I keep forgetting he’s still alive. Sorry folks. Jimmy’s a good guy in his heart I know. I can still recall the image of him at the White House sitting near the fireplace in his sweater telling us all to turn down our thermostats to save energy. Kudos to a guy who started Habitat for Humanity. That truly is in my mind his greatest accomplishment. I would like to know why a person can’t walk into the U.S. Mint in Washington D.C. The day the gold mercury dimes went on sale and buy one. They say you can do it via internet or phone but it’s absolutely impossible to get thru on either one. Dealers seem to get them all and then Jack up the prices to ridiculous amounts. Why can’t a coin collecting taxpayer have the same opportunity? Doesn’t seem very fair to me. LOL. I wish some $ would trickle down on me soon so I can get the next two US Mint centennial gold coins! Jimmy wasn’t a top 10 prez for sure, but he can still build a heck of a house even at his advanced age. Bless his heart, as we say in Texas. The new CNN special series on the 1980s had an hour show featuring Reagan’s presidency & I was in nostalgic nirvana!